For the first time in my life, I wore a pink t-shirt. It is not that I’ve never worn a pink garment before. Once during my uni days, after a night of partying, I woke up from a drunken stupor wearing a pair of pink bra. Don’t ask. My aversion to the colour pink is nothing sexual. It is just that pink dulls my complexion and draws the attention away from my size-10 shoes. 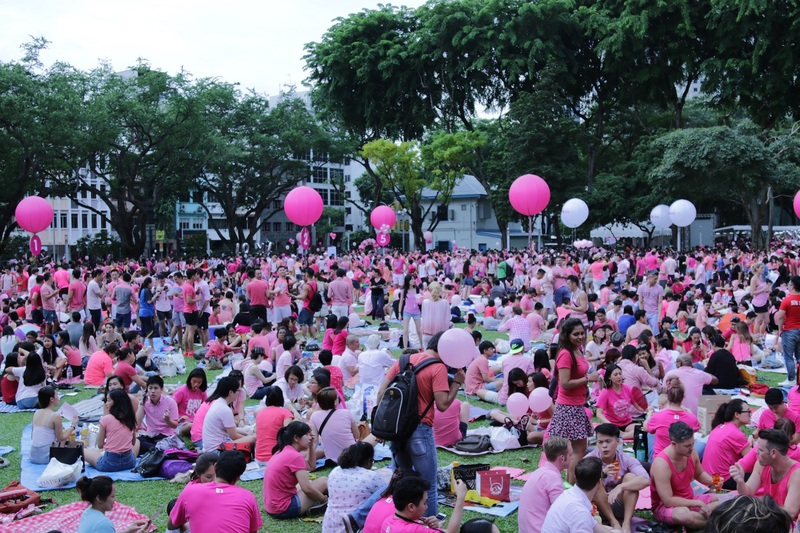 So as I sat on the lawn at Pinkdot2015 last Saturday, surrounded by a sea of pink, it dawned upon me that some lesbians, and gays were more beautiful than some straight women. Although it didn’t make me want to be gay, I was willing to learn. I was tempted to give it a go with that damn hot lesbian sitting beside me. She would have made a very good tutor. But then I realised that I wasn’t made to be a tailor and I was always awkward with a pair of scissors. I should really stop wearing pink. It caused my mind to wonder and wander. In between the screams and the predictable speeches, I managed to read an article from my very manly smartphone, Samsung Edge, written by a gay man lamenting about the difficulties in coming out in Singapore. In it, he knowingly or unknowingly, eloquently articulated what PM Lee had said; that Singapore is still a conservative society as far as gay marriage is concerned. The writer wrote that it would be difficult for him to be open about his sexuality because his family and friends would not have approved. So if an LGBT found it difficult to come out of the closet, should he/she blame the government? To do so would be unfair because in some areas, such as the norms and mores of the society, the government could only represent the existing values of that society. And the existing value of Singapore as far as sexual orientation is concerned, is on the right of the spectrum. And therefore it is only right that the government represent that value. And it is interesting to note that LGBTs who had found it hard to openly declare their sexual orientation were themselves conservative in their outlook. Because if they were liberal, they would have already pushed their closet wide open and sashayed proudly under the rainbow. But is there such a thing as a conservative homosexual? The three hours that I spent at Pinkdot 2015 somehow convinced me that there was. A conservative LGBT movement, made in Singapore in our own inimitable way. When I think of the LGBT movement in the western world, I think of the debauchery of gay pride. They were loud, narcissistic, downright obscene and were meant to insult the sensitivities of the mainstream. The in-your-face posturing and `us-against-them’ attitude are what alienated them from the conservatives in the society. But none of those existed at Pinkdot 2015. The event was meticulously managed just like almost everything else in Singapore. Everyone was dressed decently and behaved politely. There was none of the anti-establishment bullcrap that Hong Lim Park was sadly now famous for. There was no anti-government jibes. No anti-religion rhetoric. Heck! They even had traffic wardens with loudhailers asking people not to jaywalk! It was all clean fun and it came off as very `Singaporean’. Very conservative. And who knows. Over time, the society would be more accepting of the LGBT community and perhaps one day, they might even be allowed get married to one another. But not to my children. If my son were to tell me that he was gay, I’d be disappointed and would have flipped out. Though I wouldn’t go as far as to throw him down from the roof, blindfolded, I might lock him up in a room with 7 or more prostitutes for a week. I might drop in once in a while to check on him and the 7 or more prostitutes. I paid for them damnit! Whether they’d blindfold him would depend on their expertise. He might come out as a lesbian but at least I tried. But maybe I’d be more understanding to my grandchildren. But that would depend on their parents which consequently would have to depend on the local LGBT community’s own agenda and how they intend to bring it forward.